Amplified Events, Seminars, Conferences, …: What? Why? How? Tomorrow (Tuesday 15 March 2011) myself, my colleague Marieke Guy and Paul Shabajee from ILRT, University of Bristol will be facilitating a workshop session on “Amplified Events, Seminars, Conferences, …: What? Why? How?” at the JISC 2011 conference. This session will review UKOLN experiences in the provision of amplified events together with the experiences of the Greening Events project funded by the JISC and provided by staff at ILRT. An Events Planning Toolkit to help event organisers think through what type of event they need to hold (physical, virtual or hybrid) and then to provide assistance in the form of guidelines and technology tools with each stage in the process to enable them to reduce the negative sustainability impacts of their event. We hope that the participants will provide feedback on the type of guidance and tools which will be needed when providing amplified (hybrid) or virtual events. It would seem appropriate that a session on amplified events should itself be amplified. Although a WiFi network will be available at the conference we do not know how usable this will be of if there will be any barriers (such as firewalls) which would inhibit the amplification of the session. However if possible we will try and make the various resources available and also stream a video of the session. 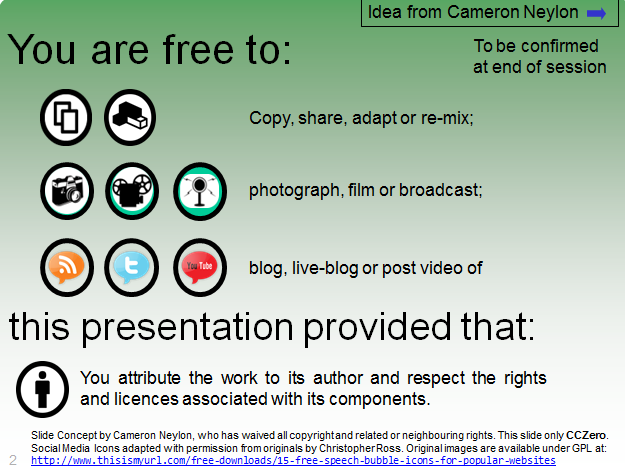 Also note that, inspired by a suggestion from Cameron Neylon, the slides which provide an introduction to the session include a set of icons which make it clear that permission for amplification of the session has been granted. This is an illustration of a guideline which we will be proposing for those who wish to organise an amplified event – and we will be looking for feedback (from the participants at the session and readers of this post) as to whether you feel that this is a useful approach to adopt. The session will take place from 15.00-16.00 on Tuesday. I will try to update this page with a link to information about the amplification of the session. I will also tweet details from my @briankelly account. Note the hashtag for the JISC 2011 conference is #JISC11 and in the absence of any official tags for the workshop sessions I suggest that the #amp tag is used to refer to tweets associated with the session. Also note that the “Introduction to workshop / Amplified Events: What and Why?“, “How to Amplify an Event” slides and “Amplification and Rethinking Events” slides are available on Slideshare and are embedded below. This entry was posted on 14 Mar 2011 at 2:30 pm	and is filed under Events. Tagged: JISC11. You can follow any responses to this entry through the RSS 2.0 feed. You can leave a response, or trackback from your own site.